We all know, more kitchen time is never a bad thing. Below are some of our favorite kitchen/cooking/baking hacks from homemaderecipes.com for home chefs of all experience levels. Make your time in the kitchen better with these innovative shortcuts. Hacks are huge right now and with good reason! More people are finding new creative solutions to age-old problems like tear-jerker onions and easy homemade bread. What does this mean for us? Even more time spent in the kitchen as we test, try and (if we’re lucky) come up with our own hacks! And, as we all know, more kitchen time is never a bad thing. Below are some of our favorite kitchen/cooking/baking hacks for home chefs of all experience levels. Make your time in the kitchen better with these innovative shortcuts. The days of passing the task of chopping onions to your significant other are behind you now! For tear-free onion chopping, place your onions in the freezer for 15 minutes before dicing. This will reduce the tear-inducing compounds found in onions. We’ve all had it happen to us before and if you’ve never experienced the trauma and heartache that is broken egg shells in your batter, then consider yourself one of the lucky few. The next time this happens to you, wet your fingers before attempting to grab those shells out. Wetting your fingers will make the task a lot easier. We’re sure this is a hack you’ve seen before, but it’s so great that a list of cooking hacks without it just wouldn’t be the same. If diner-style hash browns is what you’re looking for, try making them in a waffle iron. A waffle iron is a great “hack tool” to have in the kitchen as it doubles as a sandwich press and can even make perfect cinnamon rollsand roasted chicken! 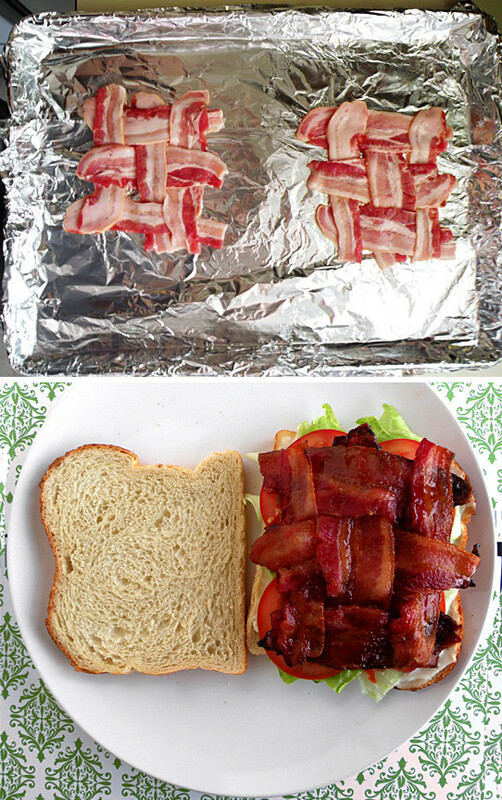 The perfect BLT has arrived with this crisscross bacon hack! To ensure you get crispy bacon in every single bite, crisscross your bacon like so (see above). These tacos are a bit wider than traditional hard shell tacos, but you’ll find that these are able to hold more filling and stand upright on their own! The finish? Crispy, crunchy and heavenly. Keep your brown sugar from clumping by putting marshmallows in the bag! Genius! If you don’t want to put marshmallows in the bag, you can also plaza apple slices or a wet paper towel to retain your brown sugar’s moisture. Grilling your fish on a bed of lemons will not only infuse a fresh citrus flavor into your fish, it will also keep it from sticking to the grill.